Reprint. Originally published: New York: Random House, 1987. THE NUMBER ONE BESTSELLER'I like thinking big. I always have. To me it's very simple: If you're going to be thinking anyway, you might as well think big.' - Donald J.
TrumpHere is Trump in action - how he runs his business and how he runs his life - as he meets the people he needs to meet, chats with family and friends, clashes with enemies, and changes the face of the New York City skyline. But even a maverick plays by the rules, and Trump has formulated eleven guidelines for success. He isolates the common elements in his greatest deals; he shatters myths; he names names, spells out the zeros, and fully reveals the deal-maker's art. And throughout, Trump talks - really talks - about how he does it. 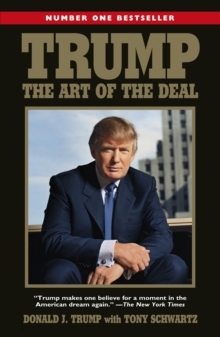 Trump: The Art of the Deal is an unguarded look at the mind of a brilliant entrepreneur and an unprecedented education in the practice of deal-making. It's the most streetwise business book there is - and the ultimate read for anyone interested in making money and achieving success, and knowing the man behind the spotlight.